Where did we get sidetracked? It seems rather odd, I often think, that despite all the measures taken to ensure our safety these days, we are probably more at risk now than we have been for a long time. Back in the day, it never crossed my mind to wear a helmet when I was riding a bicycle, or a skateboard or moped, for that matter. I do not remember ever wearing a seat belt as a youngster. I learned to drive on the road long before I was of the age to obtain a permit. I assume my dad — and some cousins — figured I should know how to drive before I was legally allowed. At a fairly young age I could run all over town, pretty much anytime I wanted, as long I was home for lunch and supper. Same goes for wondering off into the woods. And I did not need a cell phone or some other device to tell me when that time came. In the warmer months, we ran through neighbors’ back yards and sometimes climbed atop their outbuildings, well into the night, and we found other mischievous ways to entertain ourselves at their expense, but never heard a complaint. We argued and fought a lot as kids. But I rarely, if ever, remember anyone suffering much more than a bruised ego, and usually by the next day we were buddies again. We had wars. All kinds of them. We used sticks as swords and metal trash can lids as shields. We had dirt clod fights — the only time I remember getting hurt is when I was trying to pry one out of the ground and flipped most of the dirt in my eyes. We played with Jarts. The ones with metal tips on them that stuck in the ground really well. We boxed. We threw tomatoes, apples, grapes and even rocks at each other. We threw firecrackers toward one another, shot Roman candles at each other (yes, I have been hit with a flaming Roman candle ball), and we had BB gun wars. What male out there, over the age of 50, has not shot someone, or been shot with, a BB gun? Usually, that was during a momentary lapse of judgement or a spurt of orneriness, but when we got a little older, on a couple occasions, we split up into teams, went our separate ways into the nearby woods and yards, and commenced to have a BB gun battle. That was not the most wise thing we ever did, but it was fun and adventurous, and we did not have paint ball guns or souped up Nerf guns like there are today. Usually, we were smart enough to require all the participants to wear some type of goggles or other eye shield. But I’m relatively certain that we didn’t always have enough to go around. There was one such war, when I must have been 15, that particularly stands out. On this day we had quite a crowd, and as we split up teams we noticed that one of the boys was carrying a pellet gun. For those of you who don’t know, you can pump a pellet gun just about as many times as you like, and with each pump, the gun becomes a little more powerful. So we made a rule. The person with the pellet gun was not allowed to pump it more than two times before any one shot. As the battle played out, a buddy and I were laying in a weed-covered fence row, waiting for one of our opponents to show themself, when the distinctive sound of the pellet gun rang out. At pretty much the same time my buddy angrily muttered something, rolled over and raised up his three layers of shirts, and showed me a little trickle of blood running down his side. That did not settle well with my buddy. So, as things often happened back then, the rest of the participants kind of backed away, and the two guys with a beef squared off to settle their disagreement. The guy with the pellet gun — the taller but less stocky of the two — started rolling up his shirt sleeves like he was ready to fight. But as my buddy started toward him, the pellet gun guy suddenly took off running. About half way to his nearby car, with my teammate in hot pursuit, the pellet gun guy stopped, whirled around, and leveled his gun at my buddy. “Halt, or I’ll shoot,” were the exact words that came out of his mouth. When my buddy hesitated, the pellet gun guy made a dash for his car, jumped in, locked the doors, and fired up the engine. In the meantime, my buddy had found a large, thick stick —more like a decent sized tree limb — and as the pellet gun guy hurriedly drove away, my buddy was whacking his car with that big stick, while the rest of us were falling over each other laughing. That was the last BB gun battle I remember. After all, we were coming of age, and BB guns wars started to seem like child’s play compared to cruising and chasing girls. Man, things sure seemed better and more simple back then. I wonder where we got sidetracked? 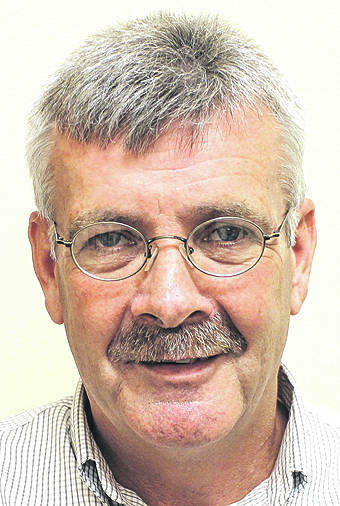 Jeff Gilliland is the editor of The Times-Gazette. He can be reached at jgilliland@timesgazette.com or 937-402-2522.